I'm losing track of how many times I have been to the Haffner Cave this trip. Today I went back with my friend Pat Delaney and another Minnesota transplant to Canada, Kendra Stritch. The temperature was much colder than we were expecting which made for a miserable start to the day. I sprinted up the warmup trying to reach the top before my fingers started to freeze. After Pat and Kendra took their turns we took shelter far back inside the cave. Inside the temperature was significantly warmer and we could thaw out our freezing hands and feet. To salvage the day we would duck out from deep inside the cave and climb on Caveman. It ended up being a really good day for me. Surprisingly I felt good even though I felt like I was pretty wrecked the day before. I ended up doing 11 laps on Caveman. The first two laps I rested before going again. Right after lowering off from the 3rd lap we pulled the rope and I jumped back on to do the 4th lap.I did back to back laps like this until 9,10,and 11 which I did all three in a row. Pat starting out Caveman while I was further back in the warmer section of cave. 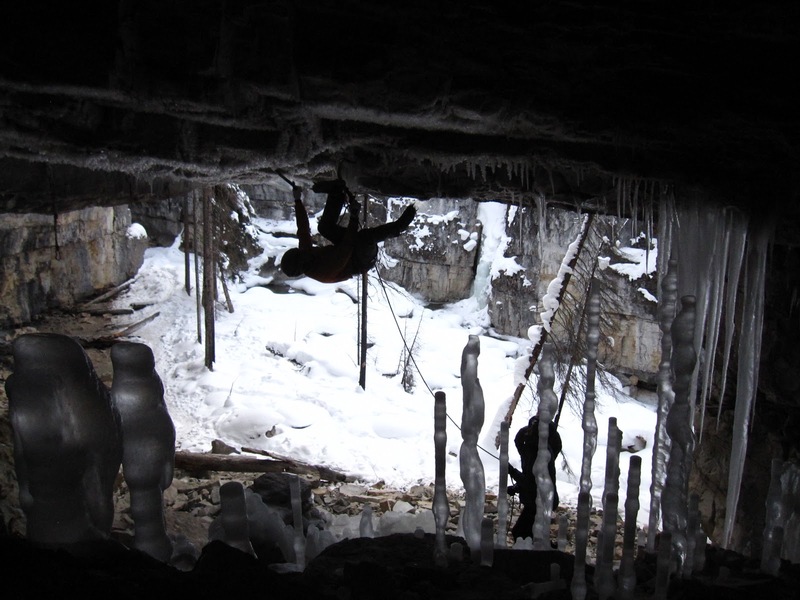 The ice stalagmites form as water drips from the cave ceiling and freezes in the cold air in the lower section of the cave. Hoarfrost coats the cave roof near the entrance as the moist air freezes to the cold rock. I think part of being able to do this was muscle memory and getting the route wired, but I think my steep route endurance is making a big improvement as well. The last lap my hands felt like they were opening and it was hard to pull with my arms, but some how I still made it.